Moovera have an alternative to the E30 FON, the £2,700 Moovbox F Series ! This entry was posted in osde and tagged access point, adsl, hotspot, mesh, network, wi-fi on 28/02/2007 by osde8info. A BarCamp is an ad-hoc gathering born from the desire for people to share and learn in an open environment. It is an intense event with discussions, demos, and interaction from participants but make sure you have read The Rules Of Bar Camp first ! There is even a Bar Camp News Visual Aggregator. This entry was posted in osde and tagged education, information, social, social network, visualisation on 28/02/2007 by osde8info. FreeDOS is open source software; you can view and edit our source code. Their website contains floppy, fdbasecd and fdfullcd (a live-cd) images that you can download and boot your PC from. This entry was posted in osde and tagged dos, free libre open, geek, gpl, live cd, opensource, sysadmin on 28/02/2007 by osde8info. GNU FSF Free software is a matter of the users' freedom to run, copy, distribute, study, change and improve the software. This entry was posted in osde and tagged copyleft, fsf, gnu, gpl on 28/02/2007 by osde8info. This entry was posted in osde and tagged beta, crm, opensource, project management on 28/02/2007 by osde8info. This entry was posted in osde and tagged marketing, sales, web analytics on 28/02/2007 by osde8info. This entry was posted in osde and tagged opensource, web analytics, webdesign, webdev on 28/02/2007 by osde8info. The purpose of the Honeynet Honeywall cdrom is to make it easier to deploy, manage, and derive value from honeynet technologies and you can even create a Honeywall software appliance virtual machine ! This entry was posted in osde and tagged firewall, network, security, software appliance, virtual machine on 28/02/2007 by osde8info. This entry was posted in osde and tagged news, tips, virtual machine, virtualisation on 28/02/2007 by osde8info. 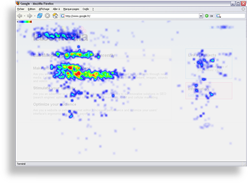 ClickHeat is a "visual heatmap of clicks on a HTML page, showing hot and cold click zones". This entry was posted in osde and tagged ajax, visualisation, web 2.0, web 3.0, webdesign, webdev, webstats on 28/02/2007 by osde8info.